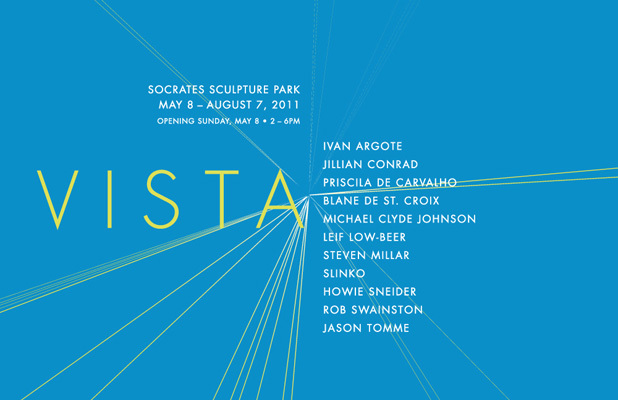 Socrates Sculpture Park is pleased to announce the opening of Vista, on Sunday, May 8, 2011, from 2-6pm. Curated by Alyson Baker, with Lars Fisk and Elissa Goldstone, the show will explore the interplay between methods of viewing and the interpretation of the physical world. Vista includes eleven new works by artists: Ivan Argote, Jillian Conrad, Priscila De Carvalho, Blane De St. Croix, Michael Clyde Johnson, Leif Low-beer, Steven Millar, Slinko, Howie Sneider, Rob Swainston, and Jason Tomme. Vista will explore the ways that methods of viewing and observation determine the assessment and evaluation of an object or scene. The works in the exhibition will employ visual alignment, perspective, and the framing of a site-line or point of view to dictate perception. The show will re-examine themes and ideas that were initially laid out in the Park’s 2002 show, View, and is being curated in response to a reemergence of these topics in current artmaking practices. The Park’s location along the East River provides a spectacular view of Manhattan that is the backdrop for all the exhibitions presented at the Park. This show will take particular stock in the Park’s location and the outlook that it affords of urban greenspace, iconic cityscape, river, and open sky. 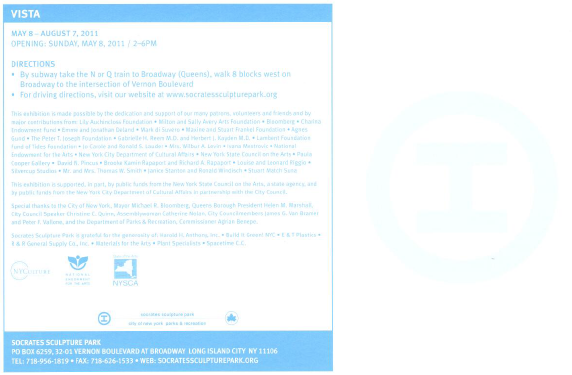 Vista Exhibition Panel On Saturday, May 21, from 3 PM to 4:30 PM: Socrates staff and exhibiting artists will lead a free presentation and discussion about the Vista exhibition in the Park. This exhibition is made possible by the dedication and support of our many patrons, volunteers and friends and by major contributions from: Lily Auchincloss Foundation, Milton and Sally Avery Arts Foundation, Bloomberg, Charina Endowment Fund, Emme and Jonathan Deland, Mark di Suvero, Maxine and Stuart Frankel Foundation, Agnes Gund, The Peter T. Joseph Foundation, Gabrielle H. Reem M.D. and Herbert J. Kayden M.D., Lambent Foundation Fund of Tides Foundation, Jo Carole and Ronald S. Lauder, Mrs. Wilbur A. Levin, Ivana Mestrovic, National Endowment for the Arts, New York City Department of Cultural Affairs, New York State Council on the Arts, Paula Cooper Gallery, David N. Pincus, Brooke Kamin Rapaport and Richard A. Rapaport, Louise and Leonard Riggio, Silvercup Studios, Mr. and Mrs. Thomas W. Smith, Janice Stanton and Ronald Windisch, Stuart Match Suna. This exhibition is supported, in part, by public funds from the New York State Council on the Arts, a state agency, and by public funds from the New York City Department of Cultural Affairs in partnership with the City Council. Special thanks to the City of New York, Mayor Michael R. Bloomberg, Queens Borough President Helen M. Marshall, City Council Speaker Christine C. Quinn, Assemblywoman Catherine Nolan, City Councilmembers James G. Van Bramer and Peter F. Vallone, and the Department of Parks & Recreation, Commissioner Adrian Benepe. Socrates Sculpture Park is grateful for the generosity of: Harold H. Anthony, Inc., Build It Green! NYC, E & T Plastics, R & R General Supply Co., Inc., Materials for the Arts, Plant Specialists, Spacetime C.C.